My homemade Sambal Terasi was made with Thai chilies and is very hot. If you aren’t inclined to use my recipe, you could substitute a generic chili paste and add it to suit your heat tolerance. I would also be inclined to use quite a bit more Basil than I have here (maybe even 2 or 3 times as much) but I only had a little on hand. 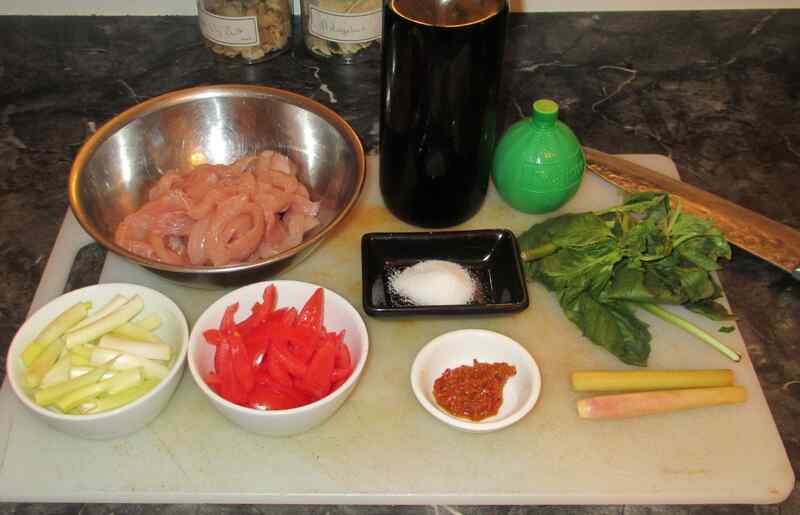 First, mix the sugar and the fish sauce with the chicken and allow it to marinate for at least thirty minutes. Finely mince the lemon grass and then pound it in a mortar to make it a coarse paste and, finally, coarsely shred the basil. Heat a half-cup to a cup of vegetable oil in you wok. 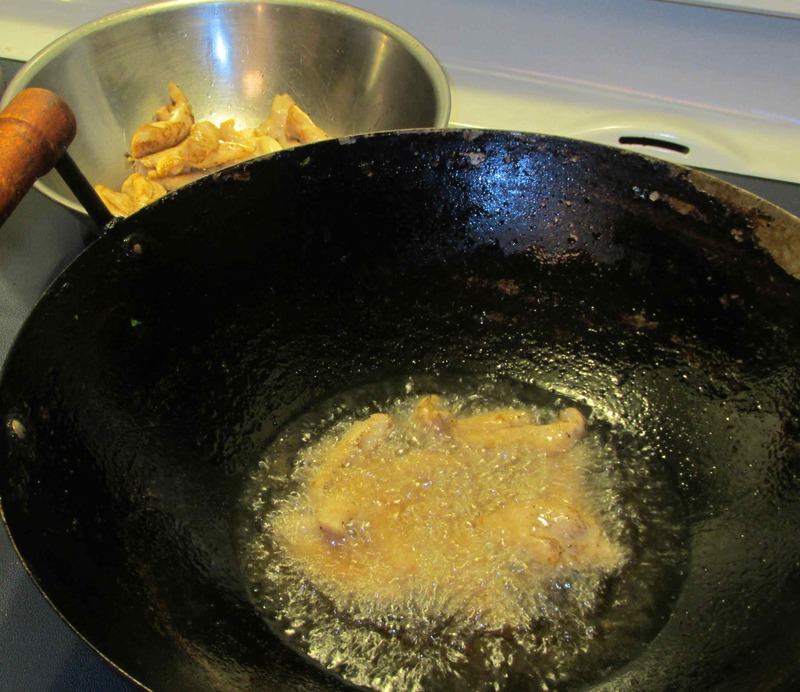 When it comes to the shimmering point, fry you chicken in two, or even three, batches until it is starting to get a little golden in places. If you do this in small enough amounts, the chicken will be nicely done on the outside but still be partially uncooked in the center, which is just what you want. 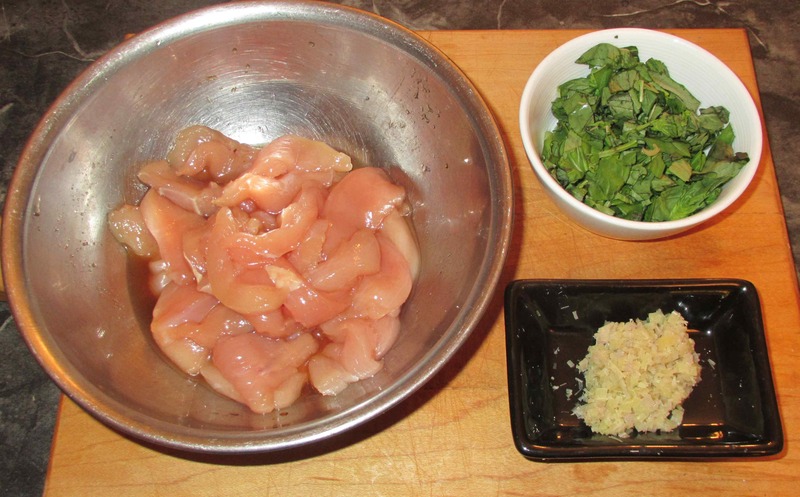 Remove the chicken to a separate bowl as each batch gets done. Drain off all but a couple of tablespoons of oil and then, when it comes back up to a shimmering heat again, throw in the scallion sections and toss them until just beginning to soften. 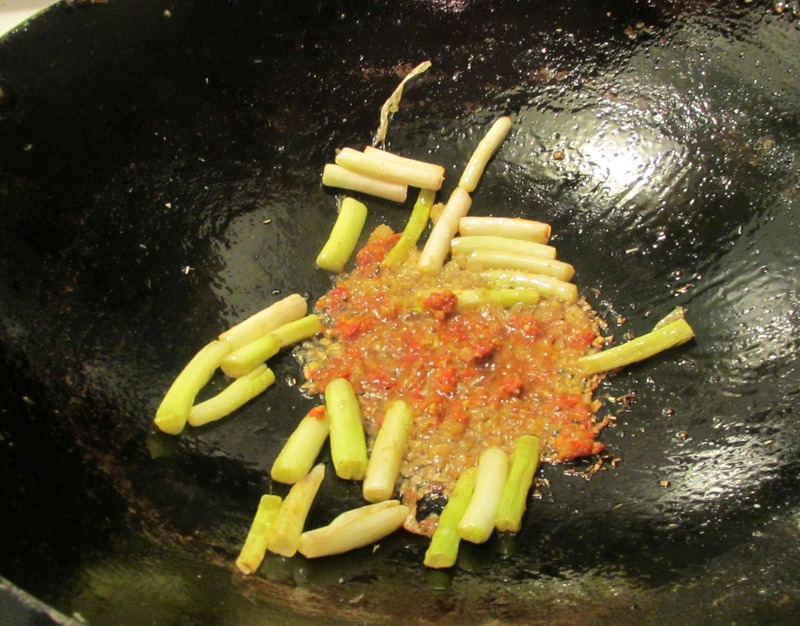 Now, scoot the sections up the sides of your wok and add the Sambal Terasi and then the lemongrass into the oil in the middle. Let them flavor the oil and release their aromas and then add the lemon juice. Continue to cook for a few more seconds until the liquid has reduced ever so slightly. 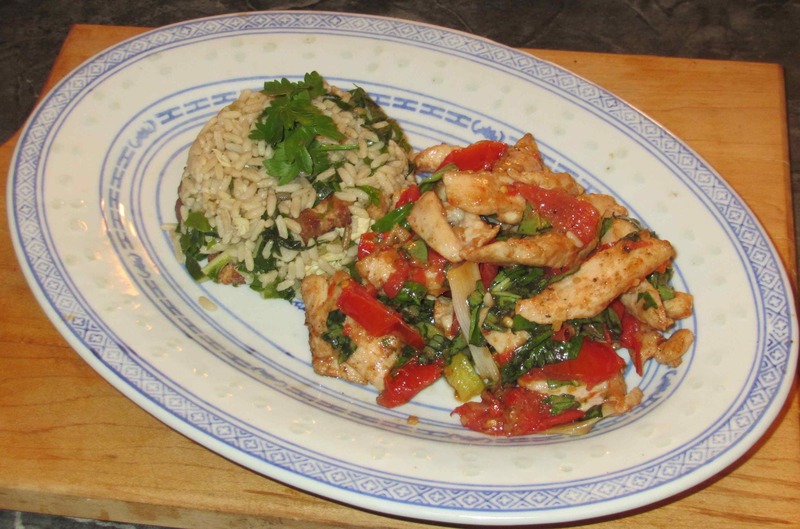 Now add the chicken back into the pan along with the tomato and stir-fry until both are cooked through but not so long that the tomato begins to break down too much (a minute or two should suffice). Lastly, add the basil, toss and stir until this is wilted slightly and then plate and serve. I served this dish with rice that I had leftover from a previous meal but I think this would actually be much better over rice noodles, possibly garnished with some crushed peanuts and a few sprigs of cilantro. 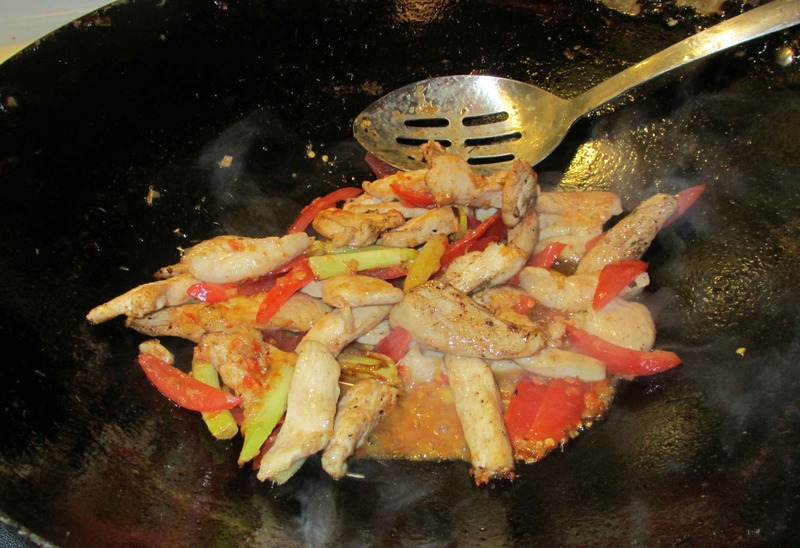 I can tell from your pictures that your wok is very seasoned and gets lot of use and with dishes like this I am sure it will get used a lot more. Very delicious and great flavor combinations. 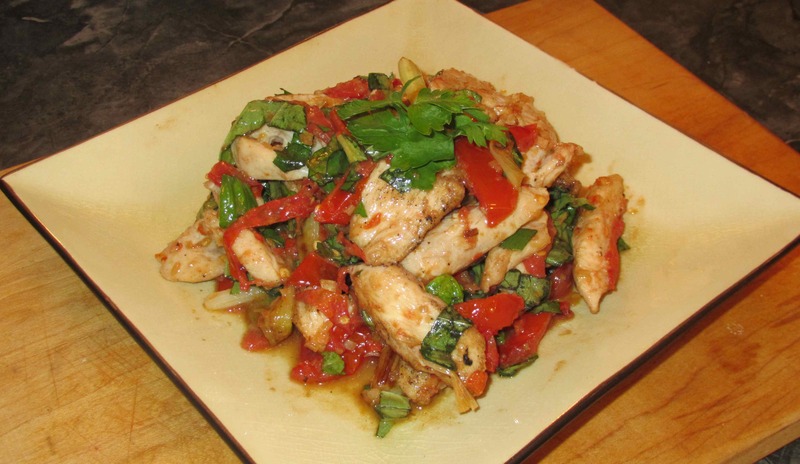 Did you use Thai Basil? Looks yummy! Your wife is enjoying Peking duck!